Real national security demands an end to white supremacy. Left of the color line. Empire resister. Unapologetic problem minority. The Islamic Center of America in Detroit was vandalized in January 2007. Anti-Muslim hate continues unabated. The following is a statement by Asian and Pacific Islander organizations in Washington State to express solidarity with Muslim, Arab, and South Asian communities facing violent anti-Muslim backlash. While the statement is specific to Washington, we encourage organizations in other parts of the country to use it as a model for their own public statements. Research shows that since the attacks of 9/11, the largest number of terrorist attacks in the United States have come not from Muslim communities, but from violent white supremacist, antigovernment, and other antidemocratic groups. Yet this fact has not been the basis for America’s War on Terror. This begs the question, whose America are we trying to secure? Since 9/11, U.S. government officials, media pundits, and too many ordinary Americans have used national security arguments to justify the profiling of Muslims, Arabs, South Asians, and other immigrant communities. This includes the warrantless surveillance of Muslim communities, and policies like “special registration”, which forced 85,000 immigrants from majority-Muslim nations to register with the U.S. government. These policies are not only unconstitutional in their reliance on religion and national origin; they are also ineffective at keeping communities safe. What they have been effective at doing is feeding the climate of fear and xenophobia that has fueled an exponential rise in hate crimes targeting Muslims, Arabs, and South Asians. Today, in the wake of recent terrorist attacks in Paris, and against the backdrop of a devastating refugee crisis stemming from conflicts in the Middle East, fear and xenophobia have once again gripped American politics, and deepened a climate of anti-Muslim hostility. A total of 31 U.S. governors, or nearly two-thirds of all governors in the country, have refused to admit Syrian refugees into their states, ignoring the fact that immigration policy is a federal issue, and that Syria’s refugees are fleeing for their lives in a humanitarian crisis of gargantuan proportions. The fact that all but one of these governors are Republican reveals the ideological nature of the politics of fear. But the Democratic Party must also be held accountable. In a recent vote by the U.S. House of Representatives to restrict the entry of Syrian refugees, 47 Democratic legislators – nearly one-fourth of the Democratic Caucus – voted on the wrong side of history. Among these lawmakers, we are particularly disappointed in those from communities of color or formerly vilified European immigrant communities, whose families have experienced nativist scapegoating. Meanwhile, the Council on American-Islamic Relations (CAIR) reports unprecedented levels of backlash against Islamic institutions and American Muslims, or those perceived to be Muslim since the Nov. 13th attacks in Paris. The extreme anti-Muslim rhetoric and falsehoods being espoused particularly by leading Republican presidential candidates Donald Trump and Ben Carson, and the broader mainstreaming of Islamophobia by other political candidates and lawmakers in the run-up to the 2016 general election, are taking a grave human toll. Both CAIR and the U.S. Council of Muslim Organizations (USCMO) immediately condemned the terror attacks in Paris. Despite this, incidents of anti-Muslim hate violence in the last week-and-a-half have included shootings, intimidation, vandalism, armed demonstrations, and physical assault. In Meriden, CT, someone fired multiple shots at the Baitul Aman mosque. In Pflugervile, TX, vandals covered the door of the Islamic Center of Pflugerville in feces and threw torn, feces-covered pages of the Quran to the ground. In Orlando, FL, someone fired shots into the home of Amir and Nehal Elmasri, while the couple was out feeding the homeless. In San Diego, CA, someone shoved the stroller of a visibly pregnant Muslim woman, with her child inside it, causing it to strike her abdomen. Also in San Diego, a man attacked a Muslim student at San Diego State University, pulling off her Islamic headscarf and spewing hate. In Brooklyn, NY, a postal worker approached two Muslim women and an infant shouting, “I am going to burn your f**king temple.” He elbowed one of the women and spat in her face, and called the other woman a “n**ger”. In Philadelphia, PA, on a Southwest Airlines flight, a passenger claimed to be afraid to fly with two Palestinian-Americans after hearing them speak Arabic. These are just some of the stories. 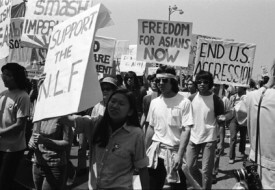 As Asian Americans and Pacific Islanders, we are intimately familiar with America’s long and shameful saga of using fear to justify anti-immigrant politics and violence. While the targets of the latest generation of American xenophobia are Muslims, Arabs, and South Asians, throughout history, people from various Asian nations have been the targets of “Yellow Peril” racism justifying brutal U.S. wars abroad, and violent repression and exclusion at home. And people from Hawai’i and the Pacific Islands have long paid the human price for U.S. military violence on their lands, all in the name of national defense. To understand these linkages, one need only look to the reference made by Mayor David Bowers of Roanoke, VA earlier this month to Japanese internment during WWII as his justification for refusing aid to Syrian refugees today. Then, as now, fear mongering and the “othering” of an entire group of people only exacerbate xenophobia and racism, while doing nothing to make us safer. On this 40th anniversary of the arrival of refugees from the wars in Southeast Asia, we are also reminded that the very existence of refugees is often the outcome of U.S. military violence. Between 1965 and 1973, the U.S. government dropped 2.7 million tons of explosives – more than the Allies dropped during the entirety of World War II – on Cambodia, whose population was then smaller than New York City’s. The bombing drove hundreds of thousands of villagers to the capital of Phnom Penh, devastated the country’s food supply system, and led to the starvation of half a million people. It also radicalized a population that had previously been politically neutral, creating a base of support for the rise of the Khmer Rouge, which would later wipe out one-fourth of Cambodia’s population through a policy of genocide. If this story sounds familiar, it should. The tragedy of the Cambodian genocide, which still reverberates today, was a result of the Vietnam War, or what Southeast Asians refer to as “The American War”. Likewise, today, half the population of Syria has been displaced by war. But that refugee crisis traces back to the first Iraq War in 1990, which triggered the collapse of Iraq that has continued today, creating political space for the rise of the Islamic State. Today there are 4 million Iraqi refugees. As scholar Vijay Prashad reminds us, these Iraqi children and families, along with the 5 million Syrians who have been displaced, should be thought of as regime change refugees, products of western intervention. And what happens after refugee resettlement? The Merriam-Webster Dictionary defines “refuge” as “shelter or protection from danger or distress”. If the Southeast Asian refugee experience is any indication, in order to find true refuge in America, refugees will have to contend with the nation’s contradictions – between freedom and democracy on the one hand, and white supremacy on the other. Many Southeast Asian refugees were settled into impoverished and abandoned neighborhoods alongside African Americans who had been fighting for freedom for generations (and still are). They soon found that they had fled one form of violence only to be thrust into another. Today, as a result of a combination of 1996 immigration and anti-terrorism laws, more than 13,000 refugees from Laos, Cambodia, and Vietnam – many who were criminalized and racially profiled in their youth – have been deported or are now facing deportation. In many ways, we as Asian Americans and Pacific Islanders have long found ourselves caught in between the global violence justified by America’s rhetoric of liberty and freedom, and the domestic reality of America’s origins in slavery and genocide. We applaud President Barack Obama for his unwavering insistence on admitting Syrian refugees, despite public opposition. We also welcome the outspoken position that Washington State Governor Jay Inslee has taken, unapologetically opening our state’s arms to Syrian refugees. This is the courage we expect from our leaders. In this era of fear and nativism, both the president and our governor have revealed that they are students of history, as all elected officials have a duty to be, to avoid repeating the mistakes of the past. We call on public officials at all levels of government to do the same. But as Dr. Martin Luther King said so prophetically in 1967, when he called the U.S. government “the greatest purveyor of violence in the world”, in order to build real democracy and security: “We as a nation must undergo a radical revolution of values.” Today the richest 80 people in the world own as much as the poorest 3.5 billion people or half the world’s population. U.S. taxpayers pay $8 million every hour to support war, a total of $600 billion just in 2015, compared to $63 billion on housing. We pay $80 billion each year to incarcerate 2.4 million people, and far more when accounting for the costs to families and communities of incarcerated and formerly incarcerated people. The outcomes of these investments are racial. They benefit a few at the expense of growing numbers of dehumanized “others” – Muslims, Arabs, South Asians, poor and criminalized Black and Brown people. Achieving real security will require us to end this savage human sorting. It’s time for all Americans to have honest conversations about the root causes of insecurity and fear, and to build a shared agenda to invest in the common good: public education, public infrastructure, jobs, affordable housing, restorative justice, and climate justice. The outcomes of war and greed, the double helix in the DNA of white supremacy, are uneven. 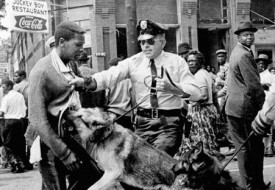 If America is ever to realize genuine peace and security, we must organize and agitate for change alongside those who are most deeply harmed by America’s profound contradictions. If you’re an organization who has signed onto this statement, the next step is to share it with your members, constituents and allies. Write a letter to the editor of your local newspaper condemning anti-Muslim violence and hate. Support and follow the work of organizations addressing the backlash including the Council on American-Islamic Relations, the National Network on Arab American Communities, Muslim Advocates, and South Asian Americans Leading Together. Visit your local mosque to provide support, especially as many around the country are the site of anti-Islam rallies. Ask your organizational partners to sigh onto this statement. Support 1Love Movement / Southeast Asian Freedom Network’s campaign to end deportation. Follow CAIR on Twitter (@CAIRNational) for reports on the current backlash. Talk to friends, families, and neighbors about what real peace and security would look like.Use books like Deepa Iyer’s We Too Sing America: South Asian, Arab, Muslim and Sikh Immigrants Shape Our Multiracial Future and Moustafa Bayoumi’s This Muslim American Life as conversation starters. 5 Responses to Real national security demands an end to white supremacy. Finally someone who gets it. In the following quote you said that Cambodia in 1965 had a population smaller than New York City which was around 6 Million people, however in the next sentence you said that the bombing drove “hundreds of thousands” of villagers to the capital of Phnom Penh. I just wanted to make sure you knew about this oversight so that other people wouldn’t use it as a way to devalue your points.